India never held a high place on my priority list of places in the world I wanted to see. In fact the idea of travelling to this extremely populated, poverty stricken land gave me anxiety prior to my departure. The reason I felt compelled to book my expensive flight was to have a reunion with a fantastic group of people I met in London. Meeting half way between the Northern and Southern Hemisphere seemed fair and as scary as India appeared to me I knew it would be ok if I was with my mates. So, after a night of end of year celebrations I took the last swig from my can of Carlton Draught and headed out my front door, passport in hand and pack on my back to catch the Skybus to Tullamarine (I should mention that it was 4am). Upon checking in I must have looked in a bit of a state as the lovely Air India hostess offered me the emergency row at the front of the plane. The flight lasted just 15 hours with a two hour stop on Sydney’s Tarmac. The inside of Delhi airport is just like any other. Sterile, Duty Free, native artwork etc. The outside of Delhi airport however is like nothing I had ever encountered at that precise moment in time. The second I stepped out of the safety of the terminal I was hounded for a taxi from all directions. People began grabbing at my pack trying to take it to their car, someone even took my printed travel documents from my hands and never returned with them. I was hung-over and exhausted and found this situation rather overwhelming, I guess you could call it a good introduction to India and an indication of what to expect from this trip. Finally after a 30 minute wait at the prepaid taxi stand I was ushered into a vehicle which would take me into the centre of Delhi. Although I was exhausted the drive from the airport was one that kept my eyes wide open. I saw Tok Toks collide with motorcycles, bodies lying on the side of the road (dead or alive), and dogs and cows all over the place. When we arrived at our destination I was told to walk down an alleyway to find my hotel. I apprehensively stepped out of the vehicle into the intensity of India and down the alleyway which featured mangy dogs, a group of people trying to stay warm next to a pile of rubbish set on fire and some more bodies under blankets (dead or alive?). 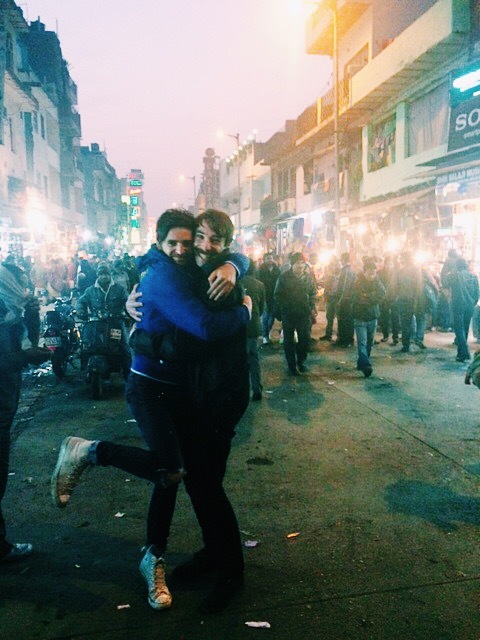 I have never felt such a sense of comfort and relief when I eventually found Clara and James at the Hotel. Due to an early train departure the next morning we went straight to sleep only to be woken twice in the night. Once by someone attempting to break into our room and a second time by a strange scratching sound coming from an unknown living creature inside the darkness of our room. At 5am the alarm went off. 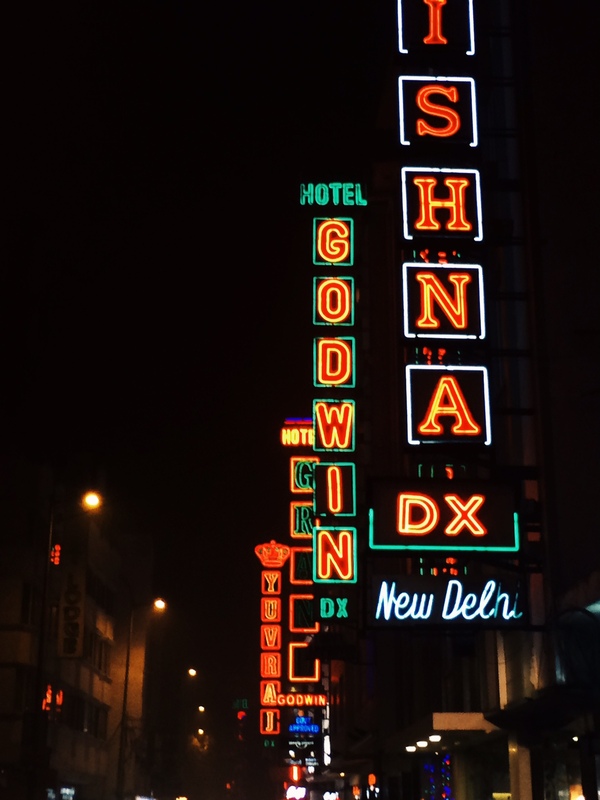 We packed our mess, tip toed over the multiple Indian hotel staff sleeping on the lobby floor and walked just a few blocks to New Delhi Train Station. 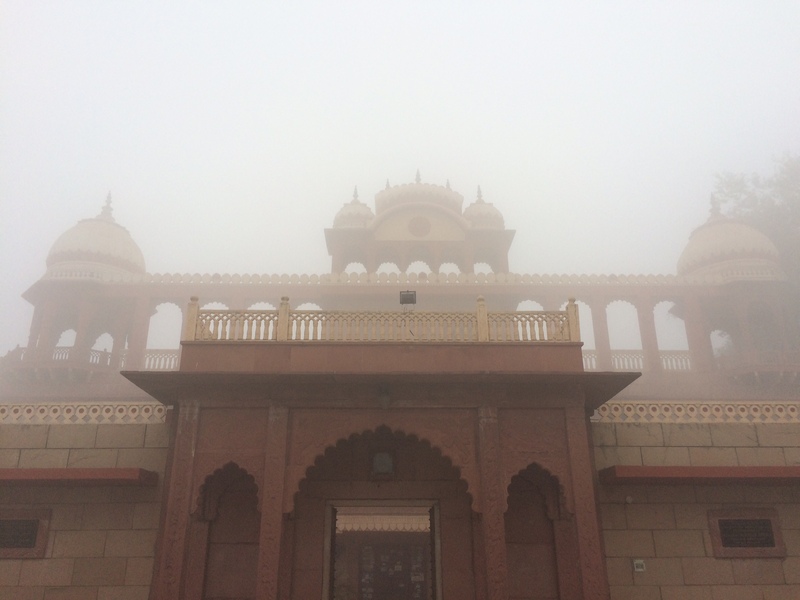 Our 6am train to Agra left the station on time and the journey which was only supposed to take 2 hours took just over four due to extreme fog. This also really limited what we could see out the window so it was a rather non-eventful journey. Exiting Agra Train station resembled leaving Delhi Airport. It was bloody intense. I had never seen rats so large in my life, scurrying around the station eating whatever food or human waste they could get. Everyone wanted to literally take us for a ride. We found our driver amongst the crowd of hustling Tok Tok owners and were driven to our accommodation. After a quick freshen up our driver took us to a few shops to purchase some warmer items of clothing to help us cope with the unexpected winter temperatures of Northern India. Then we were off the see the Taj Mahal, the reason we had come to this part of the country. Due to purchasing foreigners tickets we were able to bypass the extensive line of native Indians and walk straight to the front. Unfortunately, the airport style security was not such as easy process. The items taken from us by the guards included a journal (“There will be no documenting in the Taj Mahal.”), a deck of playing cards (“There will be NO playing in the Taj Mahal.”) and chewing gum (There will be CERTAINLY NO DRUGS IN THE TAJ MAHAL.”). We overcame this slight hiccup by depositing these contraband items in a locker before making our way through the gate. The Taj Mahal is unlike any structure I have ever seen. It is under rated and overwhelmingly beautiful. No photo can justify just how incredible this site is. Despite the fact there is hordes of tourists and locals covering every inch of free space there’s a strange sense of soothing calm in the air. This was definitely a massive tick of my life bucket list. We returned to our accommodation that night to find four other similar travellers in the family lounge room discussing transport arrangements. One couple had just returned from Agra train station after waiting six hours for a train that never arrived due to heavy fog. Trains were expected to be cancelled the next day so the man in charge of us (our over protective Indian dad) organised an SUV to squeeze the seven of us in and take us back to Delhi. Well this trip is something I will never forget, cramped in the back for four hours, weaving through the lanes of a motorway with zero visibility, dodging the cars, trucks, people and cows that came out of nowhere. I read there were a number of fatalities on that road that day and to be honest I was surprised the passengers in our vehicle didn’t contribute to that number. 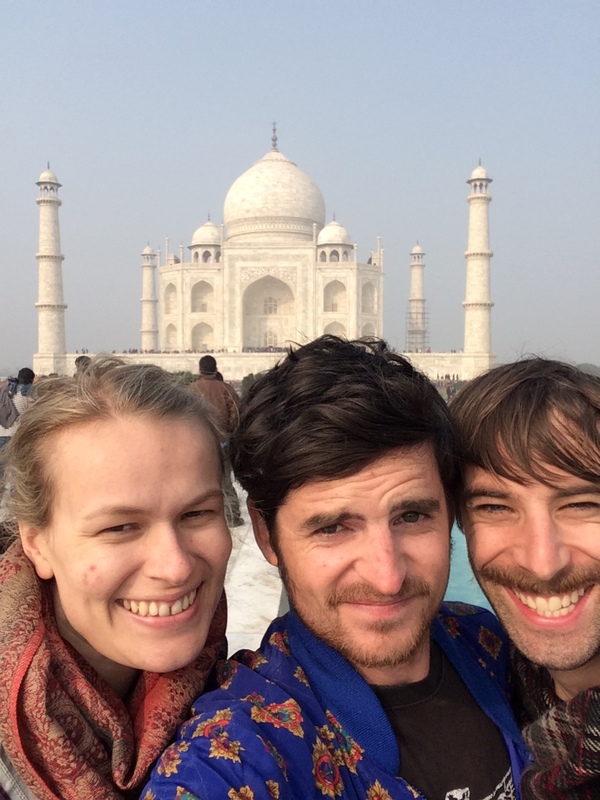 I know that some parts of this post may seem a bit negative but to be honest I could not have asked for a better introduction to India. The masses of people, the crazy roads and intense poverty fuelled me up for whatever this country could throw at me. I was excited to be in such a foreign place and couldn’t wait to see what adventures we would encounter in our next India destination. This entry was posted in travel and tagged adventure, agra, air india, australia, delhi, india, melbourne, new delhi, plane, poverty, sydney, taj mahal, train, travel. Bookmark the permalink.